Welcome to another year of Dungeon Crate. In 2018, we’re so excited to keep bringing you the awesome loot for all your Dungeons & Dragons, Pathfinder and other fantasy RPG games. We’re already planning out the next year of Dungeon Crate, and we’ll be bringing you more of the same: miniatures, dice, adventures, terrain, cards, tokens, pins and all the stuff you use at your gaming table every week. We hope all your rolls are critical hits in 2018. In the meantime, let’s dive into what arrived in January’s crate. Continuing our series of adventure books, this release is a series of 20 encounters crafted for characters from levels 1 to 3. They’re useful as a random encounter table (roll a d20 and run the described encounter) or as adventure hooks. The encounters are also specifically crafted for lower levels as well as inexperienced players, and they use iconic RPG monsters. So, this four-page booklet is great for introducing new players to your favorite hobby. Show off your inner tabletop geek! These sweet pins from our pals at 1980Who are perfect accoutrements for your gaming bag, but they’re also a fine choice if you want to add a subtle hint of crit to your apparel without rocking a shirt covered in dice or dragons. 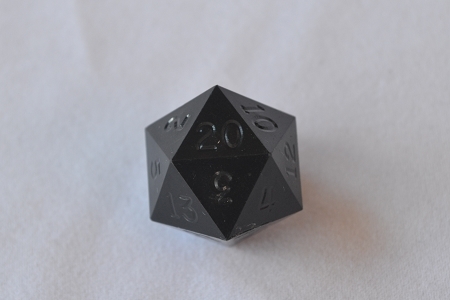 (Since the pin shows off the die’s 20 face, we also hear they bring good luck.) We especially like the glittery, shiny red finish on these pins. We dig maps and dungeon tiles and the like, but there’s something about tabletop terrain in three dimensions. These rubble walls from Nord Games help immerse your players in the game the next time they happen upon some ruins or rubble. The pieces are cast in an ultra-durable stone in single pieces, so they’ll hold up to abuse on the table or in your bag. You want your dice to roll true, don’t you? That’s the only kind of dice Gamescience makes. Unlike most of the d20s in your dice bag, this one has hard edges. It rolls more accurately and gives a more random result every time you roll. Gamescience dice are also pretty. They practically look like cut gems. We also love the way they come with unpainted numbers, just like the dice sets in the old school D&D boxed sets. Grab a crayon and get to work! This guy looks like he’s having a bad day. Sculpted by the inimitable Bobby Jackson, this angry ogre from Reaper Miniatures is looking for some adventurers to club over the head. And then maybe he’ll turn them into a meal. (Have a look at the Epic Encounters booklet to see how that might play out.) We can’t wait to get some paint on this bad guy and see how truly angry he looks. Do you love Dungeon Crate? Sure you do. You subscribed, right? Slap this patch on your game-night backpack. Or your shirt. Or your face. (Don’t do that. It might hurt.) That way everyone can know how much you love the best RPG subscription crate around.